Our Mission The mission of the Moebius Syndrome Foundation is to provide information and support to individuals with Moebius syndrome and their families, promote greater awareness and understanding of Moebius syndrome, and to advocate for scientific research to advance the diagnosis and treatment of Moebius syndrome and its associated conditions. Executive Director Kim Cunningham kim@moebiussyndrome.org Moebius Syndrome Foundation Board of Directors Vicki McCarrell President Matthew Joffe Vice President Marcia Abbott Secretary Jacob Licht Treasurer Natalie Abbott Roland Bienvenu Kathleen Bogart Kevin Smant Monica Woodall Emeritus Lori Thomas Moebius Syndrome Foundation Scientific Advisory Board Elizabeth Engle, MD Boston Children’s Hospital Harvard Medical School Boston, MA Ethylin Wang Jabs, MD Icahn School of Medicine at Mount Sinai New York, NY Marilyn Miller, MD University of Illinois Chicago, IL Richard J. Redett, MD Johns Hopkins Hospital Baltimore, MD Rhonda Robert, PhD University of Texas MD Anderson Cancer Center Houston, TX Wendy Roberts, MD Integrated Services for Autism & Neurodevelopmental Disorders Toronto, Ontario Sara Rosenfeld-Johnson, MS, CCC-SLP Innovative Therapists International Charleston, SC Ronald M. Zuker, MD The Hospital for Sick Children Toronto, Ontario Moebius Syndrome News Kim Cunningham, Editor Graphic Design Natalie Abbott newsletter@moebiussyndrome.org The Moebius Syndrome News is published two times a year. Articles, photographs, questions and comments welcomed. The Moebius Syndrome News reserves the right to edit submitted material. Opinions expressed in the Moebius Syndrome News are each author’s and do not reflect that of the Moebius Syndrome Foundation or the Moebius Syndrome News. The newsletter is on the website at: www.moebiussyndrome.org © Copyright 2017. 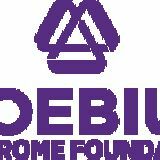 The Moebius Syndrome Foundation. All rights reserved. Greetings Friends, Spring is here and I love seeing photos of young people with Moebius syndrome on social media who are graduating from high school and colleges/ universities to move on to the next important stage of their lives. Congratulations to all grads – and to their families who have supported them throughout the years. Time is your friend with Moebius syndrome. Our babies, who are challenged at birth by feeding diﬃculties, low muscle tone, club feet and other issues, go on to become successful in life. For those of you who are new to the world of Moebius syndrome, hang in there – your children will amaze you! Research is progressing in the quest to determine the cause of Moebius syndrome. The Moebius Syndrome Foundation is providing $50,000 each year for 2016 and 2017 to Alan Tenney, PhD, a Senior Postdoctoral Fellow in Dr. Elizabeth Engle’s lab at Boston Children’s Hospital. Dr. Tenney’s work focuses on his knowledge of facial motor development and together with Dr. Engle’s lab’s expertise in the human genetics of cranial nerve development, they are working toward a mechanistic understanding of Moebius syndrome. The Foundation is also providing a $75,000 grant for 2016 and 2017 to the National Human Genome Research Institute (NHGRI) at the National Institutes of Health. The funding is being used to support research conducted by Irini Manoli, MD, PhD, and her colleagues at the Medical Genomics and Metabolic Genetics Branch of the NHGRI. The title of this work is ‘Multidisciplinary phenotyping of Moebius syndrome and other congenital facial weakness disorders.’ This grant provides funding for 80% of the salary for Flavia Facio, Genetic Counselor, to work with Dr. Manoli to compile the massive amount of data that has been collected and to work with families who travel to the NIH for the Moebius syndrome study. 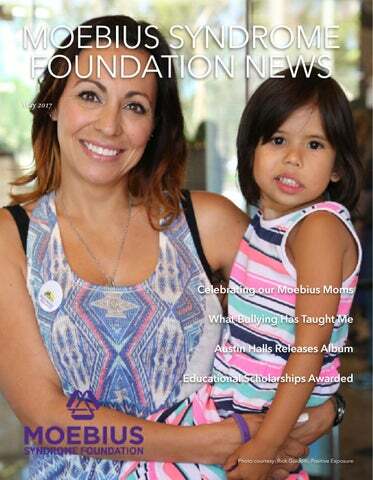 I want to reach out to my wonderful forever friend and Moebius Syndrome Foundation Co-Founder Lori Thomas (Chelsey’s mom) who recently resigned from the Board of Directors. Lori’s dedication and passion for people with Moebius syndrome and their families knows no bounds and she will continue her outreach, compassion and support to families. We love you Lori and you will be dearly missed on the Board. Lori will continue to attend the research symposiums held prior to the conferences every two years. It is because of her advocacy in getting Chelsey ‘smile surgery’ in 1996, that the Moebius Syndrome Foundation grew exponentially into what it is today. Upcoming Moebius Syndrome Foundation Regional Events Saturday, May 27, 2017 Fort Gordon, Georgia 2 PM - 5 PM Come out to meet other families, share information, fellowship and have fun! Sunday, June 11, 2017 Northeast Regional Mighty Moebius 5k Walk East Meadow, New York 10 AM - 1 PM The purpose of this walk is to promote awareness and acceptance. All funds raised from this event will go directly to the Moebius Syndrome Foundation. Here is the link to register: https://www.raceentry.com/race-reviews/northeastregional-mighty-moebius-5k-walk For more information contact Jennifer Garvey at jennifer@moebiussyndrome.org. Saturday, July 29, 2017 Palmdale, California For more information, contact Tony@moebiussyndrome.org Saturday, August 19, 2017 Grand Haven, Michigan The event is co-sponsored by Many Faces of Moebius Syndrome. Interested in attending? Visit MSF Facebook page or contact Becky Becker at becky@moebiussyndrome.org. What Bullying Has Taught Me By Kari Storm I, like many other kids, was bullied growing up, and I would like to take this opportunity to share my experience about how bullying impacted my life. I remember being a loud, outgoing, confident young child at the age of three. I often approached complete strangers and struck up conversation. I thought I was pretty awesome. Oh, to be three again! From kindergarten on, a change began to happen. That’s kind of when kids start noticing diﬀerences in each other. Being born with Moebius syndrome, I stood out as having a diﬀerence. Bullying started, and didn’t completely stop until I was in high school. So, from about age five to 15 I was bullied. I went from being loud to quiet, outgoing to shy, self-confident to insecure. I developed high anxiety and low self-esteem. I hated being diﬀerent and believed my diﬀerences were ugly. I have a lot of inner scars and pain from being bullied, but I wouldn’t change it. It’s shaped the person I’ve become and has given me my life purpose. I am so much stronger for it and possess an understanding I would have never known had I not been bullied. I have such overwhelming love, compassion, and empathy for all beings. I treat everyone I encounter with kindness. I try my best to seek understanding and forgive those who are cruel to me because I don’t know what they are going through. There’s a saying that “only hurt people hurt people”, and I’ve found that to be true; even for myself. My bullies were hurting because they, too, were being bullied in some way. So they needed an outlet for that pain and to feel powerful. I was being bullied, so, I, too, bullied at times. I was a terrible bully, though. I remember on my bus there was a mentally disabled girl, and the other kids would take her hat oﬀ her head and throw it around the bus. I was often bullied on the bus, so the fact they were picking on her took the heat oﬀ me. So, I joined in and threw her hat around. Only to go and pick it up, give it back to her, and befriend her. In 3rd grade the kids would bully this boy for being fat. I would join in from time to time. The teacher would yell at him almost every day for not having red pens. I knew his family was poor, so I asked my mom if we could buy him some red pens. I anonymously put them on his desk before class one day. Another time in 4th grade, we learned in class about May Day and how people would leave May Day baskets on people’s doorsteps, ring the doorbell, and run away so they wouldn’t know who left it. So I asked my mom to help me make a May Day basket, and I left one on the doorstep of that same boy. Thinking back on it, it almost brings tears to my eyes how freaking proud I am of that sweet, kind-hearted little girl. With all the crap she was going through, she still had such compassion and empathy. Sometimes I am still so hard on myself, but thinking back on everything I’ve been through, I know I’ve come so far and have grown so much as a person. Undoing 20+ years of low self-esteem and negative self-talk takes time and patience. More and more I see glimpses of that three-year-old me. For so long my anxiety has made me want to run and hide from people because I didn’t trust them to *see* me. But, I’m ready to be seen. For so long I silenced my voice due to insecurity. But, I’m ready to be heard. I may not speak with total confidence, but at least I’m having the courage to speak. I want my story to make an impact. I want to encourage and inspire others to love themselves; to recognize the beauty and uniqueness in themselves and in others; and to treat one another with loving-kindness, compassion, and empathy. Think of what a beautiful world that would be. This is my life purpose. I never thought I would think of being bullied as a gift, but it truly was. I am grateful for the experiences I’ve had because they have taught me priceless lessons. I am better because of it. I’m in the process of loving myself and my diﬀerences because I am worth it. And so are you. And so is everyone. We are all beautiful; worthy of being seen, of being heard, and of being loved. Beth Battina What’s your your favorite thing about being a mom? Definitely watching how their personalties change over the years. How they develop, change and grow year every year. Now that they are in their teens, it is fun watching them mature into young adults. What’s the most challenging about being a mom? Not knowing if you’re doing it right. What are your interests/hobbies outside of motherhood? I love anything crazy, but I don’t need much me for it anymore. While spending me with friends is always something I like to do, I also cherish my alone me. I love reading – actually audio books are now my favorite. I can get other things done while I’m “reading!” What are you passionate about? Information. I am constantly seeking more information. I love reading and watching documentaries or learning a new skill. Tell me something unique about yourself. My twins were almost triplets! (One miscarried very early on.) What is the name of your Moebius child, and how old is he/she? Charlie is my sweet Moebius child. He’s 14 years old and hands-down the most interesting person I’ve ever met. Do you have other children? If so, names/ages? Yes, Charlie has a twin brother, named Mac. Two fourteen year old boys are plenty of work for me! What is your profession? I work in Human Resources and I love it! What advice would you give to other moms? Trust your instinct. I think mothers have a great instinct and intuition. They know their children the best. What’s your favorite thing about being a mom? The love between me and my kids. Sharing life together. When our hearts meet in joy. What’s most challenging about being a mom? Having other people that depend on you for everything! What are your interests/hobbies outside of motherhood? Reading, hiking, nature, digital scrapbooking, quilting, playing board games, biathalon (watch it at the winter games 2018 or on YouTube now, awesome sport), dance, marimbas, kayaking. What are you passionate about? God, treating my body (and my family's bodies) and our environment well but living to protect both and preserve our environment in a good state for generations to come, living a (man made) chemical free lifestyle as much as possible. Tell me something unique about yourself. In college I played for the women's club ice hockey team, was in the dance company, and played in a marimba band. I still like doing them all but with busy life as a mom I don't get to any of them very often. What is the name of your Moebius child, and how old is he/she? Luke is 8. Do you have other children? If so, names/ages? Hannah is 5 and River is 1. What is your profession? I am a wetland ecologist turn stay at home mom/nurse/teacher. What advice would you give to other moms? Advocate for your child, trust your mom gut, know what is going with all parts of your child's therapy and care. Know how to care for your child medically yourself even if you have nurses and others to help. Sometimes it has helped for me to stop and think about 5 or 10 years down the road when things seem very intense at the moment. Slow down a bit, let the stress go down a few notches, and spend time being okay with where you are right now and enjoy moments with your child. This is hard for me too. Work to let your kids be average kids as much as possible. Is there anything else you’d like to add? My relationship with God is a large part of how I live my life and handle care with Luke. Jesus is my rock. Things don't always go well and I don't always act like I should, but having a relationship with God has helped me work through my grief, hard times, and to enjoy my family as they are. & request to join! Then send a message to the moderator about your child with Moebius syndrome. What’s your favorite thing about being a mom? I love that I am shaping this little human being. That the things I instill within him now are the things he will take into this world. That the things I teach him are the things that will help him become his own incredible person. What’s most challenging about being a mom? For me, the most diﬃcult thing about being a mom is balance. Finding that perfect balance between mother, wife, daughter, friend, employee, woman and self. There are so many things that I find need to be done and never enough time. What are your interests/hobbies outside of motherhood? I adore photography, reading, and working out. What are you passionate about? Honestly, I am passionate about my son. It's totally cliche, I know, but I am. He's my all. I want him to be the best him he can be. Tell me something unique about yourself. When I was a little girl, I wanted to be an astronaut. To this day, when I go outside on a clear night, I always look up and wonder what it's like "up there.” What is the name of your Moebius child, and how old is he/she? Wyatt Paul is six. Do you have other children? No other children. Unless you count our dog, Jethro. What is your profession? I am a Legal Assistance/ Practice Assistant. What advice would you give to other moms? Enjoy each day. Even the tantrums. While they are sometimes diﬃcult, one day you will look back on them and smile. They aren't little long and these are the memories you'll want to hold tightest. Is there anything else you’d like to add? Some days will be hard. Really hard. You will see other children the same age as yours and compare every single thing. But, you've been given a gift. One that, no matter how many times you question or compare, calls you mommy. And when he/ she looks at you and says or signs "I Love You" and you feel as though your heart is gonna burst from love and pride, you will forget everything else. Because in the end, that's all that matters. What’s your favorite thing about being a mom? My favorite thing is watching them learn new things and explore the world. What’s most challenging about being a mom? Trying to meet everyone's needs. What are your interests/hobbies outside of motherhood? Ha ha! I've been a mom for 14 years. It's hard to maintain hobbies. But I do enjoy sewing. What are you passionate about? Healthy eating and clean living, i.e., no chemicals and the use of few medications in our lives. Food is our medicine. Tell me something unique about yourself. I’m an Army wife and we've lived in 9 states in the 11 years since my husband joined. What is the name of your Moebius child, and how old is he/ she? Cora, she is 18 months. Do you have other children? If so, names/ages? Yes. Scheeli, age 13, almost 14; Bronwynn, age 12; Piper, age 9; Wesley, age 7; Levi, age 5; Aria, age 4 What is your profession? Homemaker, homeschooling mom. What advice would you give to other moms? Don't compare your children. They are unique and special just the way they are! Your generous support is greatly appreciated! Pack Your Bags for Sunny Florida! The 13th Moebius Syndrome Foundation Conference is being held in St. Petersburg, Florida. The oﬃcial conference hotel will be The Vinoy® Renaissance St. Petersburg Resort & Golf Club. Join us Friday, July 20 - Sunday, July 22, 2018. The planning is already underway and we are adding in new topics, additional sessions, and more social events than ever before. NEED HELP FUNDING YOUR TRAVEL TO THE CONFERENCE? The Moebius Syndrome Foundation oﬀers conference sponsorships for first time attendees with financial need (adults with Moebius syndrome or parent/caretakers of a child with Moebius syndrome). A limited number of scholarships are available to help pay for registration and/ or hotel or travel are oﬀered for each conference. Look for the announcement in the coming months! You may qualify for state funding to subsidize Moebius Syndrome Foundation Conference expenses. Most states have funds available for families attending educational meetings or conferences through the state department of developmental disabilities: http://www.ccakids.org/statefunding.html. Thank you to the Children’s Craniofacial Association for this listing. Another option might be to start a GoFundMe page, where you can ask members of your family and community to help defray the travel costs to the conference. WANT TO HELP A FAMILY ATTEND THE CONFERENCE? Has the conference changed your life? You can make a donation to help a family attend the conference in St. Petersburg. Any amount will help and is appreciated! Thank you for your generous support - any amount helps us move our mission forward!